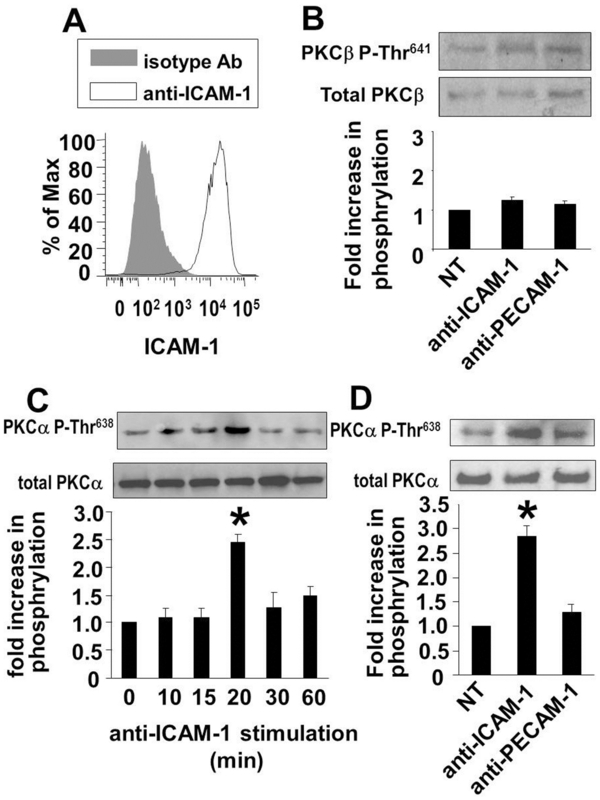 ICAM-1 activates PKCα but not PKCβII in HMVECLs. A ) At 70% confluence, HMVECLs cells pretreated with 10 ng/ml TNFα to induce ICAM-1 expression. At 24 hrs, the cells were suspended and immunolabeled with anti-ICAM-1 antibodies and examined by flow cytometry for ICAM-1 expression. B–D) HMVECLs were pretreated with TNFα as in panel A. At 24 hrs, the endothelial cells were nonstimulated (NS) or stimulated with a confluent monolayer of anti-ICAM-1-coated beads or the control anti-PECAM-1-coated beads for 20 minutes in B and D or for the times indicated in C. The cells were lysed and the activation of PKCβII and PKCα was examined by western blot with B) anti-phospho-PKCβIIThr641 or anti-PKCβII or C–D) anti-phospho- PKCαThr638 or anti-PKCα. Shown are representative blots. Shown are the mean ± SEM of 3 experiments. NT, nontreated. *, p<0.05 as compared to the nontreated (NT) groups. Vitamin E Isoforms Differentially Regulate Intercellular Adhesion Molecule-1 Activation of PKCα in Human Microvascular Endothelial Cells. Mouse anti Human CD54 antibody, clone 84H10 recognizes the D1 domain of ICAM-1. It reacts with the ICAM-1 antigen found in low levels on lymphocytes and strongly expressed on monocytes and granulocytes. This molecule is inducible to high levels by mitogenic lectins on lymphocytes and by IL-1 beta or IFN gamma on other cell types such as fibroblasts and endothelial cells. Mouse anti Human CD54 antibody, clone 84H10 detects an antigen of ~90 kDa. Mouse anti Human CD54 antibody, clone 84H10 has been reported to block ICAM1 mediated cellular adhesion and block binding of LFA-1 and P. falciparum to ICAM-1. Mouse anti Human CD54 antibody, clone 84H10 is routinely tested in flow cytometry on rat splenocytes. Spleen cells from immunised BALB/c mice were fused with cells of the MOPC 315 mouse myeloma cell line. Use 20ul of the suggested working dilution to label 5 x 105 cells or 100ul of whole blood. Makgoba, M.W. et al. (1988) ICAM-1 a ligand for LFA-1-dependent adhesion of B, T and myeloid cells. Damle, N.K. et al. (1992) Intercellular adhesion molecule-2, a second counter-receptor for CD11a/CD18 (leukocyte function-associated antigen-1), provides a costimulatory signal for T-cell receptor-initiated activation of human T cells. J Immunol. 148 (3): 665-71.
de Fougerolles, A.R. & Springer, T.A. (1992) Intercellular adhesion molecule 3, a third adhesion counter-receptor for lymphocyte function-associated molecule 1 on resting lymphocytes. J Exp Med. 175 (1): 185-90. Galkowska, H. et al. (1996) Reactivity of antibodies directed against human antigens with surface markers on canine leukocytes. Vet Immunol Immunopathol. 53 (3-4): 329-34. Rothlein, R. et al. (1986) A human intercellular adhesion molecule (ICAM-1) distinct from LFA-1. J Immunol. 137 (4): 1270-4. Dustin, M.L. et al. (1986) Induction by IL 1 and interferon-gamma: tissue distribution, biochemistry, and function of a natural adherence molecule (ICAM-1). J Immunol. 137 (1): 245-54. Simmons, D. et al. (1988) ICAM, an adhesion ligand of LFA-1, is homologous to the neural cell adhesion molecule NCAM. Berendt, A.R. et al. (1992) The binding site on ICAM-1 for Plasmodium falciparum-infected erythrocytes overlaps, but is distinct from, the LFA-1-binding site. Dyugovskaya, L. et al. (2002) Increased adhesion molecules expression and production of reactive oxygen species in leukocytes of sleep apnea patients. Am J Respir Crit Care Med. 165: 934-9. Bergmann-Leitner, E.S. et al. (2000) Differential role of Fas/Fas ligand interactions in cytolysis of primary and metastatic colon carcinoma cell lines by human antigen-specific CD8+ CTL. Jonsson, A.S. and Palmblad, J.E. (2001) Effects of ethanol on NF-kappaB activation, production of myeloid growth factors, and adhesive events in human endothelial cells. J Infect Dis. 184: 761-9. Chen, P.Y. et al. (2015) Endothelial-to-mesenchymal transition drives atherosclerosis progression. J Clin Invest. 125 (12): 4514-28. Salipante, S.J. et al. (2016) Recurrent somatic loss of TNFRSF14 in classical Hodgkin lymphoma. Genes Chromosomes Cancer. 55 (3): 278-87.